Mikasa Celebrations Winter Wonderland Votive Candle Holder, 3.5-Inch by Mikasa at Home Decor Outlet Store. MPN: 5114161. Hurry! Limited time offer. Offer valid only while supplies last. 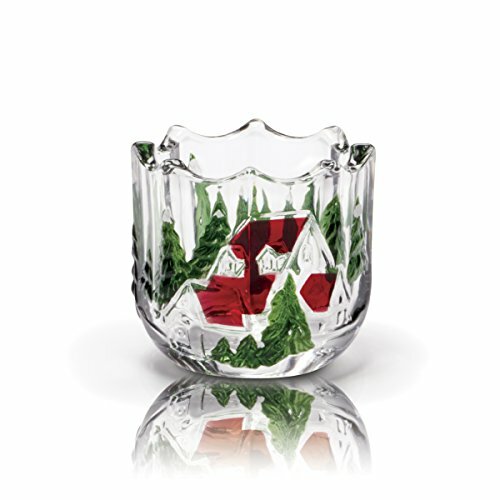 The Wonderland collection features a beautiful winter scene embossed onto durable pressed glass with hand-painted frosting and red and green accents. The Wonderland collection features a beautiful winter scene embossed onto durable pressed glass with hand-painted frosting and red and green accents. This glass votive is a charming way to bring warm lighting and a decorative touch to your home every holiday season. Adorned with a festive winter scene, this votive can be displayed on a table or mantle, and while it is great for decorating during the Holidays, it can be used throughout the winter season. Also makes a great gift. Hand wash with warm water and a mild detergent; rinse and dry immediately. Votive candle not included. Glass votive measures approximately 3-1/2 diameter x 3-1/4 inch high.